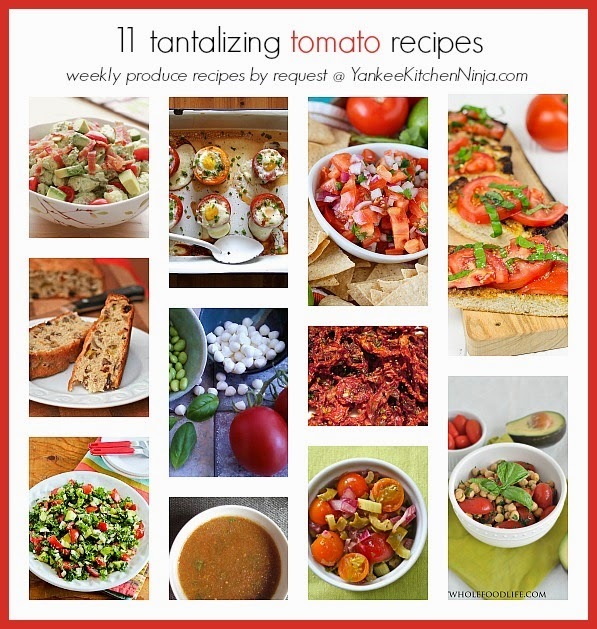 Eleven easy recipes -- some traditional, some unusual, all healthy and delicious -- for making the most of prolific, fresh, sun-ripened tomatoes. I almost can't believe it -- time flies! -- but we're nearing the end of the 2014 edition of the CSA Share Ninja Rescue, in which you can get weekly seasonal produce recipes by request all summer long (Memorial Day to Labor Day). Hopefully you've been playing along, telling me each week what produce from your CSA share, garden or farmers' market has left you stumped for ideas, and I help un-stump you with a list of delicious, healthy recipes on Tuesdays. I think this is my absolute favorite time of year, veg- and CSA-wise, because the most prolific veggie right now almost everywhere around the country is the tomato. From the most petite cherry to the giant slicers, fresh tomatoes taste to me like nothing else on earth. And while I'm happiest eating them plain, topped with a little crunchy sea salt, I've pulled together 11 delicious recipes that call for fresh summer tomatoes from my favorite food bloggers. Don't forget: There are dozens of other recipe suggestions from the past three years of the CSA Share Ninja Rescue for whatever produce other than tomatoes might be giving you fits this week. The Ninj takes requests but only until Labor Day, so be sure to leave a produce suggestion in the comments below. All of these look so delicious. I think I tend to make anything that has tomatoes as one of the ingredients. Yum. Me, too! Although I have I feeling you are like me -- just eating them plain is gift enough! Thanks for featuring my pico! Don't you just love summer tomatoes?! There's nothing bettter! Well... maybe summer corn. I love corn.